What is it? Buckwheat is not really wheat at all. It is the edible fruit of the buckwheat plant, which itself is a botanical relative of the rhubarb. Buckwheat is often ground into flour and used in foods - like pancake mixes, kasha, and Japanese soba noodles - and is considered a whole grain. You might also spot buckwheat honey on grocery store shelves. Bees make this dark, strong-flavoured honey from the nectar of the buckwheat flowers. What is it good for? One cup of buckwheat boasts 17 grams of fibre, 23 grams of protein, and a fifth of your day's need of iron. Buckwheat is also a good source of many other vitamins and minerals, such as the B vitamins. It is the only "grain" to contain significant amounts of an antioxidant called rutin, which could prove beneficial to cardiovascular health. 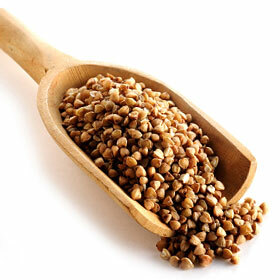 And because it is not a true grain, buckwheat is a safe food option for those following a gluten-free diet. What does it taste like? Buckwheat gives food a hearty, whole-grain texture and nutty flavour. Add it to your recipes for pancakes, muffins, and breads or to soups and stews. Cook buckwheat like oatmeal for a warm, filling breakfast. Or blend cooked buckwheat with your favourite steamed or raw vegetables, seeds, and a light dressing for a refreshing but satisfying salad. Buckwheat should be stored in a cool, dark, dry place. Buckwheat flour should be kept in the refrigerator.